In Framing, Flooring, Finishing and Cabinet Making where corrosion will not occur. In Framing, Pergolas, Hardwood Decking and where protection from corrosion is required. Used to fix Hardboard (Masonite) underlay to Timber Floors. Annular Shank for improved holding power. Used to fix Fibre Cement, Vinyl and Tile underlay to Timber Floors. Annular Shank for improved holding power. Used to fix Hardboard Panelling to Timber Frames. Used to fix timber or metal components to concrete. Used to fix Random Groove Sheet Panelling to Timber. Annular Shank for improved holding power. Used to fix Ply panelling to Timber Frames. Used to fix Plasterboard Sheeting to Timber. Annular Shank for improved holding power. Recessed Cross Head for plaster filler. For fixing Metal Brackets to Timber. Used to fix Sheet Metal components to Timber. Non-Structural. Used to fix Wire Fencing or Netting to Timber Posts or Frames. For use with structural Softwood (Pergolas) and Decking. Galvanized for protection against corrosion. Helical Shank for improved holding power. (Hardwood should be pre-drilled). Used to fix Roof Sheet Mouldings and Gutter Brackets. Non-Structural. Used to fix Fibre Cement Sheeting and Planking to Timber Framework. Used to fix Corrugated Iron to Timber. Plain or Twisted Shank. Used in Timber where corrosion will not occur. In Fencing, Pickets, Pergolas where protection from corrosion is required. Used in Upholstery Work and fixing Fly Wire Netting. Bright Bright nails are manufactured using plain steel. The nails are polished prior to packing to give a bright appearance. For indoor use only (no resistance to rust). Galvanized Hot dipped galvanizing provides a protective sacrificial zinc coating. For external use and damp internal areas. Double Galvanized Roll formed Galvanized wire is hot dipped Galvanized after manufacturing. For use in extreme external applications. Zinc Plate Electroplated zinc coating (Silver in colour) For aesthetic appearance and a low level of protection against corrosion. Not recommended for use externally. Zinc Gold Plate A passivate is applied over the top of zinc coating to harden the surface (Gold in colour). A slightly higher level of protection against corrosion compared to plain zinc. Not recommended for use externally. Solid Copper Soft malleable metal, copper in colour. Used in such applications as boating or slate shingle roofing, copper sheeting, or some architects have been known to use for aesthetic appeal. Solid Brass A metallic alloy combining copper and zinc. Yellow to brassy yellow in colour. Usually only used in decorative applications. Solid Silicon Bronze A copper alloy containing tin and small amounts of silicon. Highly corrosion resistant - can be used in salt water environments. Normally used in boating applications and is ideal for use in western red cedar (e.g. saunas). Solid Stainless Steel The key benefits of stainless steel over Galvanized or other finishes are its high resistance to corrosion and the retention of the favourable stainless steel 'look'. Stainless steel is a ferrous alloy with a minimum of 10.5% Chromium content. Grades are determined by chemical structure e.g. 316 grade contains 2 - 3% Molybdenum for added corrosion resistance. Some grades such as 316 can be used in salt water environments for boating, pools and more recently in decking for long lasting and design appeal. Nickel Plate Electroplated nickel coating for aesthetic appearance. Sometimes mistaken for chrome plating. Provides a low level of protection against corrosion. Escutcheon pins/nails are generally the only type of nickel plate product and are used for fastening name and trophy plates for decorative purposes. Glue Coated Only applies to gun or collated nails; the nails are coated with water based construction glue which provides additional bond between nail surface and timber. Brass Plate Electroplated in a solution of copper and tin For aesthetic appearance and a low level of protection against corrosion. Not for use externally. Generally only wall panel pins are bronze plated so as to blend in with the colour of the timber. Bronze Plate Electroplated in a solution of copper and zinc. For aesthetic appearance and a low level of protection against corrosion. Not for use externally. Similar applications to the escutcheon pins/nails as in nickel plate example. Plain Smooth finish round shank. These will provide suitable holding power in hardwood timbers. Helical Thread-rolled to produce a helical thread that runs along the shank. Provides additional holding power. Particularly useful in hardwood timbers for outdoor use or in particle board. Helical thread is similar in appearance to liquorice twist and can be twisted back out of the timber without any damage to the timber. 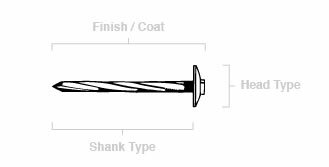 Annular or Ring Thread-rolled to produce a series of rings along the shank, giving it greater holding power than a helical thread, like for like. Particularly useful in soft timbers; plasterboard nails or silicon bronze nails. Twist shank As the word illustrates it is a twisted shank (square wire twisted). Provides additional holding power, typical uses are in roofing applications. Barbed Only used in staples. A barb is cut into the shank of each staple leg - similar in appearance to a fish hook. Duplex A collar (second head) that sits approximately 10mm below the head of the nail allowing for easy removal of the nail. Generally used in industrial form work. Flat head A broad or flat head designed to apply maximum holding power to the material being secured. Used where appearance is secondary and head is still visible. Most common applications includes: paling fences & pallet manufacturers. Bullet head A small rounded head that is able to be driven flush with timber surface or countersunk below the surface. Generally used where the finish/appearance is a primary concern. Staples - plain A 'U' shaped nail with two points. A common application is the fixing of wire (mesh or strands) to timber. Staples - barbed A 'U' shaped nail with two points and a barb cut into both legs. The barb finish provides additional holding power; rural fences and viticulture (vineyards). J-staples A 'J' shaped staple with a ringed shank designed to be driven into timber leaving the shorter arm sitting proud of the surface so that wire can be hooked over it; used only in viticulture.